Courtois isn't having the best of times at the football pitch since joining Real Madrid. 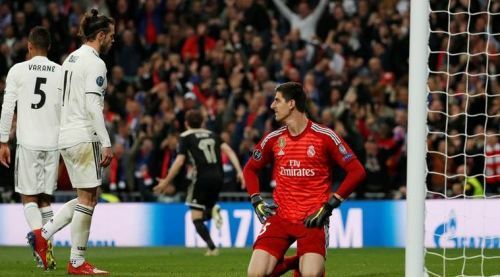 Thibaut Courtois is being 'targetted' by the Spanish media, according to the Belgian shot-stopper's father, following a woeful performance by Real Madrid against Ajax Amsterdam that saw them crash out of the UEFA Champions League. The Los Blancos conceded four goals at their own den, Santiago de Bernabeu, as the Dutch outfit overturned the 2-1 deficit from the first leg to progress into the next round with a 5-3 win on aggregate. Thibaut Courtois, who forced a move away from Chelsea, last summer, hasn't had the best of football since arriving at the Spanish capital. The Belgian became the first choice keeper at the Bernabeu, ahead of Keylor Navas, who played a pivotal role in Los Blancos' record three successive Champions League triumph. However, he has been facing severe criticism since taking over the Bernabeu goalpost from the Costa Rican. While the 13-time European champions have struggled both, defensively and offensively, throughout the season, the Belgian has conceded a total of 42 goals since arriving at the Spanish capital. The two-time Premier League winner has kept 10 clean sheets so far amidst the Galacticos' defensive struggles since the start of the campaign. Courtois faced criticism as he allowed four goals, including a Lasse Shone freekick in the latter stages of the match. However, this wasn't the first time that the Belgian has been under-fire since arriving at the Spanish capital. 'I feel that everyone is targeting Thibaut,' Courtois' father said. 'The Spanish press, and also the Flemish. As a father, I can not ignore that. 'A goalkeeper is always the first target, it is part of the job. For right or wrong, I let you judge that. But after the match against Ajax, he was targeted because of the fourth goal after he'd played well. This single mistake has taken on huge proportions. Courtois' Real Madrid future is in doubt following the re-appointment of Zinedine Zidane at the Bernabeu. The Frenchman previously blocked the move for the Belgian, placing his trust in the Costa Rican keeper, Keylor Navas.